Here it is, New Years Eve, where I'm at anyway. I guarantee in the next few days I'll get tons of emails wishing me a Happy New Year. I know because I do the same thing as soon as Christmas is over. I start telling everybody to have a Happy and Prosperous New Year, right on through the first week of January. We all do it and it's a good thing. It sure beats talking about the weather. 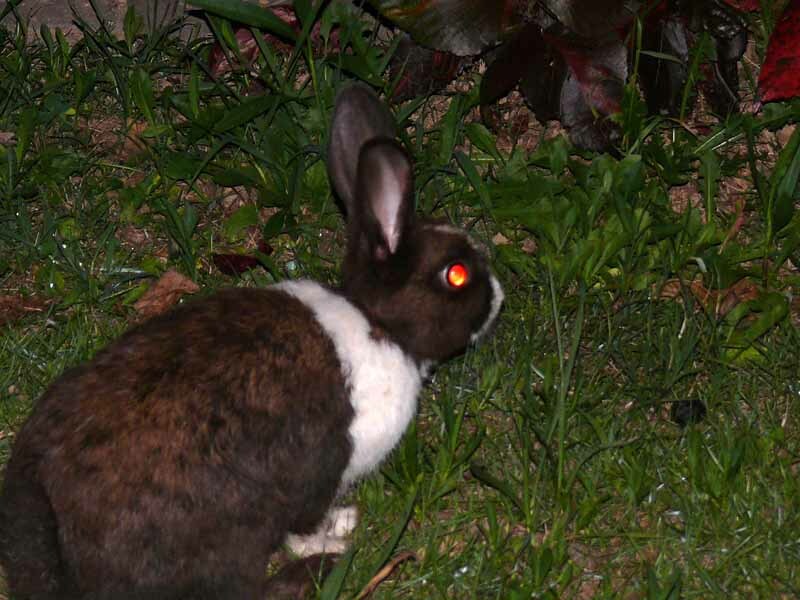 The Year of the Rabbit is 2011 so, I dug up this photo that I shot back in 2007 to show you what a rabbit looks like in the wild, at night, with camera flash. That's if you don't want to use red-eye reduction on your camera or in editing afterwards. Some people I know will have eyes like this when the wake up New Years Day after a night of celebrating. In Okinawa, we have New Years twice! The Western, Gregorian, Christian, whatever you want to call it, calendar that a lot of the rest of the world uses, is used in Japan, too. Even in Okinawa we have the Western calendar and celebrate the New Year like folks in the western world. The New Year will start January 1st and people will be popping champagne bottles, kissing strangers on the lips and singing Auld Lang Syne in Japanese in my bar tonight. And they'll be running around with hangovers for the next three days visiting temples to try and have good luck in the Year of the Rabbit, 2011. It's good for business. People are already buying rabbit jewelry, bunny footed pajamas and slippers and probably wedding gowns with rabbits sewed on them. Some of them even buy pet rabbits for their kids. Then, when they get tired of abusing them, turn them loose, like the one in the photo above. That's no wild rabbit. He's a rabbit turned loose in the wild; a feral rabbit, I guess. Here's a tip from an old Insider. According to the Chinese Zodiac, 2010 the Year of the Tiger, doesn't end December 31st 2010. The Year of the Rabbit starts on February 3, 2011. That'd make New Years Eve the 2d of February according to my calculations. Not one to put a damper on everyone's holiday celabrations I'm going to dig up that Auld Lang Syne music, buy some bottles of champagne and wash the wine glasses for tonight. What the heck, I may as well trim the beard, get all spruced up and wear my Sunday best for the New Years Party. Even if some good lookin' stranger-gal doesn't run up and kiss me on the lips, it could be my dressed rehersal for the 2011 Year of the Rabbit New Years Eve Party in February! WHEREVER IN THE WORLD YOU ARE PLEASE DON'T DRINK AND DRIVE. AND, I WISH YOU AND YOURS A SAFE, HAPPY AND PROSPEROUS NEW YEAR ! In return I wish you and your family all the best for 2011 ! !Have a nice party time!! Absolutely well written piece, Mike ! You've summed up the festive season's spirit so succinctly ! Please accept my most hearty wishes for a fantafabulous New Year, now, as well as in February 2011 - a year filled with the choicest best that this world has to offer and a life brimming with action, adventure and excitement :-) !! Best wishes to your family members too ! You take care and have fun, right through this coming year ! Man, do you have a way with words! I'm glad to hear from you, always. Yuo know if I try and type all the big words you used with my one typin' finger I'd misspell half of them. So, all of the above back to you, plus throw in a bit of good luck, as well. Thank you very much. The party last night had me up 'til 3AM. I was up before 7 this morning getting ready to go shoot my camera. That's what I call a party and a Happy New Year all at the same time! Best wishes in the New Year for you and yours. Wildlife Photo (Osprey) You Lookin' at Me?